In the Coming decade, the very famous and efficient American ride-sharing service provider Uber, will bring a new gift for its users. 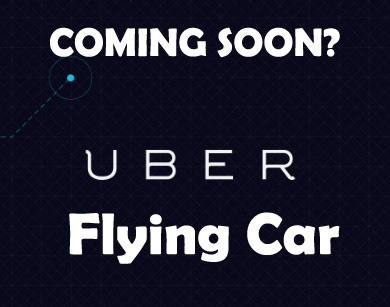 Uber technologies is planning to bring into the market its own developed electric Flying Car by this decade. This would be the very first version of a taxi service in the sky, alluding all road traffic, reducing emissions and pollutions into the city and cutting commute time to a very short journey. Uber will call this Electric Flying car- vertical take-off and Landing (VTOL) aircraft. The chief product officer Jeff Holden, posted a white paper on the firm’s website talking about the flying car, an abbreviation of Vertical Take-off and Landing. What Uber boasted about its plans regarding the Flying aircraft was, “rapid reliable transport between suburbs and cities, and ultimately, within cities”. People suffer heavy traffic in large cities with congested infrastructures, also people who need to commute to offices travelling large distances also face many issues in their day to day life, and this aircraft would be a bone stop solution for all such issues relieving the users from a very major trouble. Uber also revealed that almost a dozen companies are working on this project, they all are coming up with different designs and approaches out of which the best will be selected and finally turned into an outcome. The new idea the nearest competition of the Helicopter, would be much more efficient than the later. The electric aircraft, which would be quieter, cheaper and less polluting than its nearest equivalent – the helicopter. This would use autonomous technology making it much safer by “significantly reducing operator error”. Uber also assures the public that VTOL flying cars will be twice as safe as driving a car through both autonomy and distributed electric propulsion (DEP). The use of these DEP would allow the use of fixed-wing for the aircraft VTOLs, which wouldn’t need large helicopter rotors and provide lift with greater efficiency than rotors. Uber knows this very well that it would have to face a lot of challenges in making these VTOL vehicles viable and feasible for the public. The very first of which is the troubles it will face in certification process for new aircraft concepts and later the use of reaching the best and the most efficient battery technology for electric transport and air traffic control. The last but not the least in fact the major concern of the the project would be operational barrier for deploying a VTOL fleet is a lack of sufficient locations for landing pads, said Uber. The company described the vision as “ambitious” but believes “it is achievable in the coming decade if all the key actors in the VTOL ecosystem — regulators, vehicle designers, communities, cities, and network operators — collaborate effectively”.